When ordering a kid we require a $100 deposit per desired kid. Orders are on a first come first serve basis. Prices listed are not negotiable. No Refunds: No cancellations are allowed. 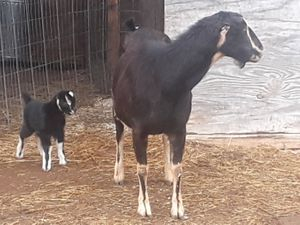 However, If a kid you have chosen is not available (doe does not have what you have reserved), we can transfer to another breeding of your choice or you may wait until the following year for the originally reserved kid. If in any way possible, the kid(s) must be picked up on the farm or at one of our shows. If shipping is needed, buyer will be responsible for any extra charges (crate, shipping, health certificate, etc.). Once the kid is born, the buyer will have 3 weeks to get the rest of the payment to On Holiday Farm. If correct payments are not here on time, the animal will be assumed forgotten and will be put up for sale or retained and the deposit will not be returned (according to our NO REFUNDS stated above). Kids WILL NOT be shipped or handed over until all fees are paid in full. Discounts can be given when you are buying more than 2 kids at once. There will be a $100 fee per month that the kid stays, starting at 4 weeks of age. But if the kid is bottle raised and for some reason you cannot take it, there will be a $125 fee per month starting at 2 weeks of age. Buck kids out of first fresheners WILL NOT LEAVE THE FARM INTACT until we have time to evaluate the dam's udder. Vaccinations available per buyers request.